Is it just me or has this been the busiest week ever? Here are some links to check out in your free time (HA!). Need book recommendations for holiday giving? First, check out my 12 Days of Giving posts, but if that's not enough, check out Jon Scieszka's Holiday Reads for Your Kids. I mean, he is our ambassador after all... Thanks to A Fuse #8 Production for the link. Speaking of gift guides, if you're shopping for tweens, don't miss Sarah's Tween Book Buying Guide for the Holidays. She's got lots of great suggestions! And while you're buying books for those on your gift-giving list, you might consider throwing in a few for the Book Angel Charity Contest. You can benefit kids of all ages and you just might win a fabulous prize for yourself! And speaking of giving, I know you've got books on your shelf that you don't need (or maybe that's just me...). Consider giving them in honor of blogger Dewey who passed away just over a year ago. 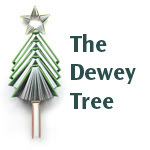 Participate in The Dewey Tree. Again, you could win fabulous prizes in addition to helping out an organization in need. Kelly over at Stacked is wondering "Where have all the fat girls gone?" She looks at the covers of books that feature overweight protagonists and finds a disturbing, though not entirely surprising, trend. ...what I must conclude is that there is no one truth for anything. It's all a matter of perspective. Nonfiction writing is a job of taking what people say and then making your best educated guess as to what the truth really is. Do read the rest of the post. Food for thought. Whether you're a New Moon fan or not, this LOLCats parody is freakin' hilarious. Thanks to bookshelve s of doom for the link. If you have as many Diary of a Wimpy Kid fans as we do at my library, you might think about doing a program for them. But what will you do? Jennie answers that question in her post about the Wimpy Kid party she did at her library. This is not the Rainbow Brite I remember! Thanks (I think) to Sarah at GreenBeanTeenQueen for the link. And that's all I've got for you today. Now, back to your busy week! Yep, I was posting about Rainbow Brite last week I think? That is not Rainbow Brite-I hate how they have to bring everything back and ruin it. And I LOVED the LolCats New Moon! Third Hunger Games book coming in August!